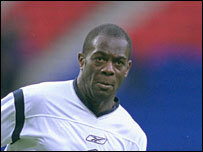 Southend have signed former England striker Michael Ricketts on a two-year deal from Leeds. Ricketts is the Championship newcomers' second signing in rapid succession, following the capture of Motherwell defender Steven Hammell. The 27-year-old spent last season on loan at Cardiff and Burnley, and will replace the retired Shaun Goater. Ricketts was capped once by England coach Sven-Goran Eriksson, against Holland in 2002.